Almost exactly two years ago, I started CAROL W's CORNER. OK, technically, I started it in October 2007, but I only posted once, then didn't post again until January 1, 2008. In that post, I said I was starting a blog because I thought teachers should always be learners. The blog was my learning for 2008 and thanks to people like Franki and Mary Lee, I learned a ton. Now, two years later, I'm writing my 305th post (nothing compared to how faithfully some people post) and I feel like I've got the hang of blogging, or at least most of the time. My project for 2010: figuring out the i-phone I bought two days ago. Let me backtrack a little. I've been with the same phone company since 2002. That's a pretty long time, I think, in terms of customer loyalty. Recently, however, I have begun to think about changing. First, the company accidentally turned off my son's unlimited text messaging. My December phone bill was over $500 ($335 more than usual). After I recovered from my heart attack, I called the phone company to sort it out. An hour later, they realized it was their mistake, and that my son had had unlimited texts for more than three years, but they would not give me my money back, they would only credit my account. Then my sons got some money for Christmas and wanted to use it to buy new phones. No deal at our company- the boys had gotten new phones for Christmas last year. One son is eligible now, the other, for no reason anyone can figure out, cannot have a new phone until October 24. The boys had been begging for iphones anyway, so we walked across the street to our local BIG BOX, and somehow we all ended up with iphones. The old phone company can use my $335 credit to cancel my account. So now I have an iphone. Of course my sons were using theirs by the time we had driven the mile from the store to the house. Me? Not so quick. Mine sat in the bag on the kitchen table until later that afternoon, when my younger son got impatient with his slow mother, and set it up for me. That night, he showed me how to make a phone call. Yesterday morning, waiting for K at basketball practice, I figured out how to use the calendar (and then I read an editorial in the paper this morning from a columnist who is going back to a paper and pencil calendar! Hmm). I have always had a very basic cell phone- the kind where I could call or text my sons, and that's it. The i-phone is a whole new ball game. I don't know how to do anything fancy- can't quite access the internet, or take pictures or videos, or play Scrabble with my niece at college in California. But I'm working on those things. I guess the iphone will be my new learning for 2010! About once every five years, I totally, totally, totally fall in love with an adult novel. Interestingly, it's usually a book about women and the power of their friendships. I loved THE DIVINE SECRETS OF THE YAYA SISTERHOOD, then SECRET LIFE OF BEES. I just finished THE HELP by Kathryn Stockett, and it's definitely going on my list of new favorites. Skeeter Phelan has just graduated from Ole Miss. She really wants to get a job in the world of publishing in New York City, but returns instead, to her family's plantation in Jackson, Mississippi. Skeeter is surprised to discover that Constantine, the family's maid and one of Skeeter's closest confidantes, is no longer employed by the family. No one will tell Skeeter where Constantine has gone. I loved THE HELP. It made me laugh and it made me cry. I fell in love with Skeeter and Aibeleen and Minny, and wished I could sit at Aibileen's kitchen table drinking coffee with them. I admired the strength, and courage, and wisdom of these three women. As with most works of historical fiction, I had new insights into that particular period of time (I think this would be a great read aloud for a high school American History class). A terrific read-- I can't recommend it highly enough! Anyone who knows me at all, knows that I am an avid reader. A gotta-read- every-day kinda gal. I read just about anything with print- magazines, newspapers, cereal boxes, kids' books, professional books, poetry, signs on mailboxes, blogs etc., etc. What I don't read, at least not much during the school year, is adult fiction. It's not that I don't like adult fiction, it's just that between a full time educator, and a full time mom, I don't have a whole a lot of time. I'm starting to believe, though, that I need to rethink that decision. EDGAR SAWTELLE brought me back to the roots of what I believe about teaching kids to read. First, it reminded me of the importance of background knowledge. As a dog lover, I totally connected with Edgar and his family. Almondine was my Ramsey, and now, to a degree, the dog that Jack Black is becoming. Smart, impudent, strong-willed Essay, another dog important to the story, was my Maggie, and now Stargirl. I loved reading about how the family cared for their dogs. The book made me want to dig out DOG TRAINING FOR DUMMIES and spend some time working with my badly behaved teenager puppies. I don't think my non dog-loving friends would connect with this book or enjoy it quite as much as I did. Finally, EDGAR SAWTELLE reminded me how much readers need to talk. I loved EDGAR SAWTELLE, but there is a lot I didn't quite understand. Today, even though it's Christmas Eve and even though I have plenty to do, and even though I'm sure most of my friends are spending time with family and friends, I want to talk to my dog-loving, book-loving friends-- Laura, or Stevi, or Kyle to see if they have read the book, and to see what they thought. I want to talk about Almondine. I want to talk about the ending. I need other readers to help me make sense of what I read. Friday. The last day before Christmas vacation. Ten year old D. stops by the library to return A DOG'S LIFE by Ann Martin. He hands the book to our librarian then stands for a minute. Gretchen is not sure what he wants. "Do you need a new book for vacation?" she asks. Gretchen notices a ribbon bookmark sticking out of the book. She opens the book to hand it to him. "No," says D., "I want it to stay with the book." The ribbon, one that D probably got in class, says EXCELLENT. "It goes with this book," D. declares. He asks Gretchen if they can tape it into the book so it will be sure to stay there. Gretchen obliges then D shows her a review he has written. Today I read A DOG'S LIFE. This book is the most amazing book I have read so far in my life. This book is mostly about a dog and her life. This now old dog that has been named many names is now Addie, and has been through many hard things. Addie has lost her brother, mother, and friend, Moon, but Addie has not lost hope, and has not lost her soul. Today I've finished this amazing book and hope I can find this book again and keep it instead of borrowing it. And that is why I became a teacher. When my feelings are hurt too. You can buy the book at THE TATTERED COVER. The website for THE PLACE WHERE POETRY BEGINS is here. You can watch a few of the kids reading their poems here. Thank you Steve for this amazing gift of the heart! I'm dating myself, but when I was a little girl, one of the books I absolutely loved was the WORLD BOOK ENCYCLOPEDIA, and specifically the H volume of the WORLD BOOK. I loved H because H contained the Human Body. And the Human Body had all of these great color transparency diagrams. First, you saw the outside of the body. Carefully, carefully turn that page, and you saw the nerves and blood vessels. Turn again, and you were inside the body, looking at the organs. I spent hours poring over the pages in that book (and fighting with my sisters over who got to look at the H book, but that's a story for another day). 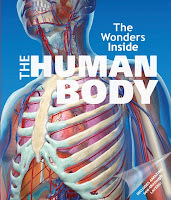 Recently I received a review copy of THE WONDERS INSIDE THE HUMAN BODY. As I read through it, I felt like I was carried back in time to my WORLD BOOK ENCYCLOPEDIA DAYS, except this book is way, way better than that. WONDERS INSIDE THE HUMAN BODY has over 90 pages of color transparencies, way, way, way cool photographs, sophisticated diagrams, and cut aways. The text in the book is minimal, instead, most of the information is contained in the extensively labeled photographs and diagrams. There are two page spreads on any number of aspects of the human body- different organs, systems, senses, etc. This book would make a terrific Christmas present. It would be a terrific invitation for those "developing readers" in your life- they could pore over the images in this book for hours, and the need to know about those pictures would get them through the brief amount of text. It would be a great mentor text for a nonfiction unit- you could teach kids about simple and complex diagrams, cutaways, writing interesting captions. There is also a really interesting color coded table of contents. "Reading MOONSHOT gave me the feeling I was back up in space," said Michael Collins, the Command Module Pilot of Apollo 11. 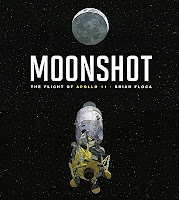 I've never been to space, but reading MOONSHOT, I felt like I was right there with Michael Collins, Buzz Aldrin, and Neil Armstrong, as they locked their hands into heavy gloves and their heads into large, round helmets, squeezed into the Columbia's sideways seats, and took off into the summer sky. And I was there as the astronauts went "rushing into the darkness, flying toward the Moon, far away, cold and quiet, no air, no life, but glowing in the sky." And I was there as Armstrong and Aldrin walked on the moon, "dust and stone beneath their feet, where no seed has ever grown, no root has ever reached…"
the mighty, massive Saturn V.
The illustrations are a contrast too. Some pages are done in very light pastel colors. Others, when the astronauts are in space, have an all black background. Some two pages spreads are black on one side, showing the astronauts on the moon, and then pastel showing people on earth. There's a tremendous sense of perspective and movement. A really nice addition to any classroom library (or for the space lover on your Christmas list)! The kids at my school don't have much, or at least they don't have much in terms of material goods. I want my kids to know, especially at this time of year, that they are not alone. That things will get better someday. And that no matter how little you have, you can still give something. 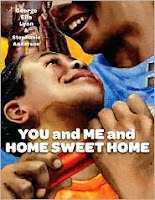 This weekend, I found a new favorite Christmas book, YOU AND ME AND HOME SWEET HOME by George Ella Lyon, based on the author's experiences building a home for HABITAT FOR HUMANITY. Eight-year-old Sharonda and her mother have worn out their welcome sleeping on the couch at her auntie's house. They are feeling hopeless until one day, their church offers to build a home for them. Sharonda and her mom work at the house from Day One. Sharonda is eager to help and even rides the bus to the house every day after school. One day a volunteer helps her build a window box. Another day, she passes out water to all of the workers. Finally, the house is ready and Sharonda and her mother move into their new home. Stephanie Anderson's illustrations are perfect. Early in the book, they are dark. As the house goes up, and the family's situation becomes more hopeful, the illustrations become lighter, and more colorful. And there are lots of good construction type pictures for the "Bob (or Bobette) the Builder" types. The gift of helping. The gift of yourself. Something everyone can give. Is there a more perfect Christmas present? I have spent my entire career in urban schools. I love teaching urban kids about 95% of the year. The weeks between Thanksgiving and Christmas, however, are absolutely heartbreaking. My urban kids watch as much television and see as many commercials as their more affluent peers. Their families don't have the resources, though, to provide the expensive toys and name brand clothes and shoes that they want. The little kids are sure that Santa will bring them. The older kids know Santa won't come, but they still hope for miracles. The financial stress present in most families during this time, is even greater in urban settings. And as a teacher, even a teacher who is not particularly materialistic, I still wish that every child could wake up Christmas morning to a tree of presents and more importantly, a houseful of love. 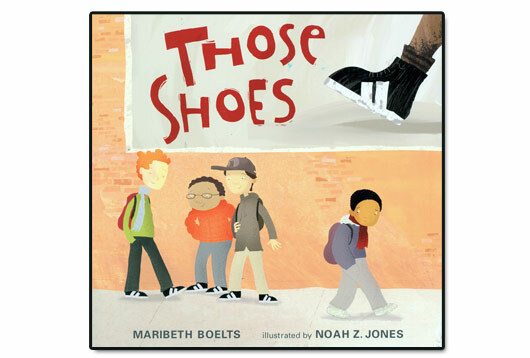 THOSE SHOES is the first book I will read to kids during the holiday season. Jeremy desperately wants the high top, two stripe tennis shoes that all of his friends are wearing. His grandmother, however, is clear on the difference between needs and wants. Jeremy needs new winter boots, he doesn't need new high top, two stripe tennis shoes. When his tennis shoes fall apart, he has to go to the social worker's office, and select a pair of babyish, cartoon character tennis shoes that are nothing like the two stripe high tops he was hoping for. Later, he finds the longed for shoes at a thrift shop; he buys them, but they are too small, and they give him blisters. He finally gives his special high top two stripe shoes to another little boy that needs them. The year is 1903. The car, or at least the car as we know it, has been in existence for about ten years, and there are only 150 miles of paved roads in the entire United States. Horatio Jackson, a wealthy doctor from Vermont who is vacationing in San Francisco, takes a bet that no one can drive a horseless buggy cross country from California to New York. Four days later, Jackson and a mechanic, Sewall Crocker, set out on their cross country adventure. A few weeks later, they are joined by Bud, a bull dog, who makes the trip perched in the front seat, wearing driving goggles. The trio plows through various obstacles- the rocky ledges of the California Sierras, the sand of the Oregon desert, a storm of grasshoppers in Omaha, rain and more rain, mud, mud, and more mud, not to mention endless flat tires. Eight thousand dollars 5600 miles, and 63 days later, they arrive in New York City. A fun, light-hearted story with cartoon-like illustrations that I know kids are absolutely going to love. From the time I was very young, I loved , loved, loved horses. Despite the fact that we lived right smack in the middle of the city, I wanted a horse more than anything. I took horseback riding lessons on the old tired trail animals at Mark Reyner's riding stable, collected horses and horse memorabilia, and read every horse book I could get my hands on. Two of my absolute favorites were MISTY OF CHINCOTEAGUE and STORMY, MISTY'S FOAL by Marguerite Henry. According to an author's note, the ponies actually live on the island of Assateague. There are various stories about how they got there- some believe they were castaways from a Spanish shipwreck, others think farmers moved them there to avoid paying taxes. 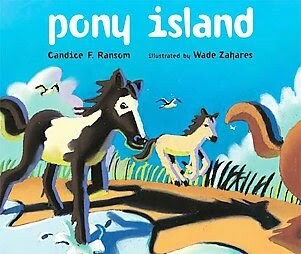 However the ponies came to the island, they have been there a long, long time. Since 1925, the Chincoteague Volunteer Fire Department has a pony roundup once a year. They swim the ponies across the channel from Assateague to Chincoteague. The pony auction and carnival raise money for the Chincoteague Volunteer Fire Department. Each year, more than 75,000 people flock to the island to watch the ponies make their five minute swim. After the event is over, the ponies return to Assateague, where they run wild for another year. (For the animal lovers in the crowd, the fire department feeds and cares for the ponies throughout the winter, and they are checked by a veterinarian several times throughout the year). Ransom has done a terrific job capturing this historic event in rhyming poetry. Equally wonderful, however, are Wade Zaharas' beautiful illustrations. Bold, vivid oil paintings, with lots of interesting use of line and shadow. The end pages feature the island at dawn or dusk, and are pretty and quiet and peaceful. Other pages, like the page where the ship wrecks, or where the ponies run through the village, are bold and action packed. I think kids will want to go back and look again and again; I know I sure did. POETRY FRIDAY is at Becky's Book Reviews. Jim Burke posted this poem on the ENGLISH COMPANION NING this morning.Jane Kenyon is much more articulate than I am, so I'm borrowing it, with huge thanks to Jim (not sure why the whole poem can be posted, but I figure Jim is much savvier than I am on the ways of the internet, so I am posting the whole thing too). My niece and nephew have always known me as the book auntie. Since they were born, I've deluged them with books for every Christmas, holiday, and birthday. Yeah, I give the stuff on their lists- the purses and legos and video games, but I also make sure there is a book (or two or three or ten) under the Christmas tree. My books were never the first presents Gregory or Megan opened or played with, but they always got used and loved eventually. And the books they usually lasted a whole lot longer than the other stuff I bought! Over the next few weeks, I'm going to feature a few books that would be perfect book auntie presents. 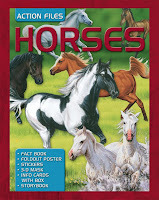 HORSES: ACTION FILES (Silver Dolphin Books) is a book for the horse lovers in your life. The book is not really just a book, it's actually a collection of all things horse. Opening the cool 3D cover (which makes me a little nauseous, but I think it's a function of old age! ), the reader finds a 24 page fact file with sections on the anatomy of a horse, horse types, horse care, and fun and games with horses. There are lots of great photos and drawings, diagrams, fascinating facts, and suggestions for further research and activities. The publisher has a website that covers not only horses, but lots of other great nonfiction topics as well. There are suggestions for other books (fiction and nonfiction) and also movies. I can definitely see myself using this book in a classroom nonfiction study- it's well written, has interesting information, and it has lots of text features that kids need to know and be able to use. I would have bought HORSES based on the fact file alone. This book contains lots of other goodies though, and I would be remiss if I didn't mention them. There are sixty horse stickers, scattered on pages throughout the book. There are 18 info cards, each showing a different breed of horse (kind of like baseball trading cards) and a special envelope to keep them in. There is a horse mask kids can assemble. There is a giant foldout poster. And there is a fiction selection, not quite novel length, but longer than a picture book. More good news. If you know kids who love sharks, or Egypt, or gladiators, those are other topics currently available in this series. I'm hoping there will be lots more eventually. contribute to the peaceful feeling of this book. Are you familiar with the The Global Fund for Children? They are an organization dedicated to bettering the plight of children and youth around the world through providing grants to organizations working in those areas. They also strive to "promote global understanding through the use of film, photography, and children's books." I've enjoyed many of their books over the past ten years- GLOBAL BABIES is one of my favorite baby shower presents, I also love sharing TO BE A KID with students. The Global Fund for Children has come out with a new book this year, and it's a stunner. FAITH is a photo essay that captures the essence of different religions around the world. Each two-page spread addresses a different tenet of faith, e.g. we pray, we chant and sing, we read our holy books, we listen to and learn from others, we cleanse ourselves, we visit holy places, we observe holidays in our homes or places of worship, we care for those around us. The text is usually only one sentence; it's the beautiful, beautiful photographs that proclaim, again and again, that though we are all very different, we are also very much alike. On one page, for instance, the text says, "We show our faiths through what we wear…" The photos show six different religions- four little Muslim girls from Turkey, wearing decorative head scarves, an Indonesian boy wearing a songket udeng (a ceremonial headdress), a Mennonite boy dressed in "plain clothes," a Buddhist girl with thanaka face paint, three beautiful Jain girls in ceremonial headdresses before a procession, and Sikh boy wearing a Patka. The authors have included every religion I can think of-- there are photographs of Jews, Christians, Muslims, Buddhists, Farsi, Native Americans, Hindus, Jains, and many others. A map in the back shows the loctions of all of the countries in the book. 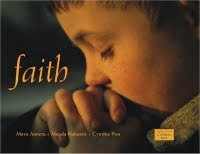 There are also three or four pages of notes about the elements of faith, as well as an extensive, and very detailed glossary of words to know. Thank you, Global Fund for Children, for helping us to understand that we are all much more alike than different! I posted this found poem last year, but I really love it. Maybe I will make it an annual tradition. but of all that we have. but the presence of those who love us. but the gentleness of its mystery. but the warmth of hope rising. but of our healings and blessings. but in the light of the present. but acceptance, compassion, and forgiveness. May we remember to feed our spirit by living out of thankfulness. POETRY FRIDAY IS AT JULIE LARIOS' DRIFT RECORD. OK, I admit it. I'm a sucker for a good dog story. Found a new one in my CYBILS nominee pile. 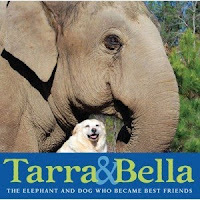 For twenty years, Tarra was a performing elephant. After many years of hard work, she was allowed to retire to a newly created elephant sanctuary in Tennessee. All of the other elephants who came to the sanctuary quickly found elephant friends, but not Tarra. Tarra was a loner until she met a yellow mutt named Bella. From that day on, Bella and Tarra were inseparable. Deborah Hopkinson (SWEET CLARA AND THE FREEDOM QUILT, SKY BOYS) is one of my favorite picture book authors. Hopkinson knows how to take a story from history and tell it in a way that makes it interesting and accessible to kids. Her latest book, MATTHEW HENSON: CO-DISCOVERER OF THE NORTH POLE is certainly no exception. Matthew Henson was born about the time the Civil War ended. As a young African American boy, he had big hopes for seeing the world, but not much hope of fulfilling them. Orphaned at 13, Henson somehow managed to convince the captain of a sailing ship to hire him as a cabin boy. The captain took fondly to young Matt and schooled him in the ways of the high seas. Five years later, the Captain died, and Matthew Henson ended up back on land, working in a store. That's where he met Admiral Peary. Admiral Peary is a man many of us know as the discoverer of the North Pole. But did you know that he was actually not alone when he made this discovery? Peary was accompanied by none other than Matthew Henson. 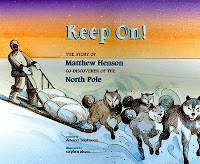 In fact, Henson was actually the one who bonded with the Inuit people, trained the sled dogs, and stood next to Peary at the Pole (after surviving a fall into the icy water a few days earlier). Amazingly, after they returned from their expedition, Henson worked as a parking lot attendant because that is the only job he could get. I loved everything about this book- Hopkinson's powerful storytelling, Henson's journal entries, the end pages that include author's note and timeline, and Stephen Alcorn's oh so beautiful illustrations, done in hues of blues, and oranges, and golds. I will be using KEEP ON as the center of an African American history unit in January. Matthew Henson has a lot to teach my kids about dreams, and tenacity, and perserverance, and dignity. Some pretty important life lessons, I think! P.S. In case you are wondering why I have not been blogging--Ten days ago, my computer had an unfortunate accident (laptop bag meets parking lot, parking lot 1, laptop 0) and I have been without internet at home since then. Some people don't believe that children should be exposed to controversial figures. If you are one of those people, then JOHN BROWN is probably not a book for you. 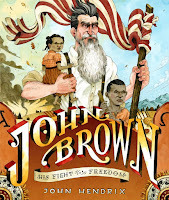 If you believe, however, that children need to understand that most people are neither entirely good nor entirely bad, that sometimes very good people make poor decisions, and that kids learn from talking about controversy, then JOHN BROWN is a book you will enjoy sharing with your upper elementary, or middle or high school students. John Brown was an ardent Christian. He believed that blacks should not only be free, but that they should be EQUAL- toward that end, he was kicked out of his home church for giving African Americans his pew at the front of the church after they had been seated in the back. Brown began his abolitionist roots working on the underground railroad in Hudson, Ohio. After the United States passed the Kansas-Nebraska act, which said that those two states could vote on whether they would enter the Union as free or slave states, Brown fought tirelessly to ensure that Kansas would be free. In one well-known battle, John and his sons stormed the homes of five pro-slavery settlers who had been threatening his family and other abolitionists, took the men to a creek, and killed them. John Brown is perhaps best known for his role at Harper's Ferry. Harper's Ferry, the home of a federal armory which housed more than one hundred thousand rifles, was viewed as a symbol of Southern power. Brown decided that he and a small band of abolitionsists would capture the armory and seize the rifles, then use them to battle the Southern slave owners. Although he was initially successful, he made several poor decisions during this battle, and was eventually captured and hanged as a traitor. Many dismiss Brown as a madman. Hendrix, however, believes that we must see Brown as a man with huge passion and convictions for the downtrodden. "I will raise a stom in this country that will not be stayed so long as there is a slave on its soil." I love when illustrations help kids understand a complex story, and John Hendrix's frontier style water colors (I'm not sure that is exactly how to describe them, but it's the best this non-artist can do) done on backgrounds of blues, tans, and golds, definitely do that. Most are bold, two-page spreads, that include a larger than life John Brown, but a few are also maps. Key quotes figure prominently in many of the illustrations. And if you enjoy reading author's blogs, John Hendrix has a great one- he includes photographs from a recent John Brown book tour, but also pages from his sketchbook. I'll be sharing this book not only with our fourth and fifth graders, but also with some of my high school history teacher friends! The illustrations in this book are by Kadir Nelson (WE ARE THE SHIP, HENRY'S FREEDOM BOX, HE'S GOT THE WHOLE WORLD IN HIS HANDS) who is most definitely one of my all-time favorites. The illustrations in CORETTA SCOTT are his usual- rich details, vivid colors, so real the people almost seem to jump off the page. If I was doing a unit on biography, or teaching students about Coretta Scott King, I would probably read a more traditional biography first (there is actually a brief biography in the back of this book), then share Shange's poem. Prior to reading CORETTA SCOTT, I'd ask kids to list important events from her life, then to listen for these as I read. The book is short, so I could read it two or three times to let kids soak in the beautiful language. 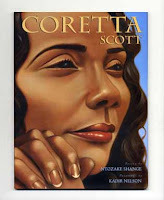 If kids were writing biography, I might ask them to choose a few important events from the person's life, then write a poem, using CORETTA as a mentor text. I have a few little quirks. Well, actually, if you asked my sons, I have more than a few. But a few for sure. And one of them is that I love knowing how things were invented or where they came from. 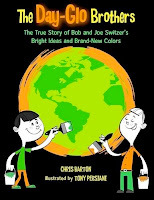 THE DAY-GLO BROTHERS: THE TRUE STORY OF BOB AND JOE SWITZER'S BRIGHT IDEAS AND BRAND NEW COLORS is a "where things came from" kind of a book. Bob Switzer dreamed of being a doctor until a work-related accident left him with headaches and double vision. His younger brother Joe wanted to be a magician. Instead, the two ended up inventing day-glo paint. This book chronicles their journey with all its stops and starts, and false tries, e.g. the time they used their mom's mixer and turned her angel food cake a pale fluorescent pink. It's an engaging story, but the book also has lots of potential life lessons about creativity, risk taking, mistake making, patience, and perseverance. Character education at its finest! First-time illustrator Tom Persiani has done a terrific job with the artwork in DAY-GLO BROTHERS. According to the back of the book, he used the computer to create fifties-style characters and settings in various hues of blacks, grays, and whites. He then digitally colorized the pictures with various day-glo oranges, yellows, greens, and pinks. At first, these colors are really pale, and there is just a little bit of color on each page As the Spitzers refine their invention, the colors become brighter and brighter, and there is more color on each page. Really clever! In the back of the book, Chris Barton explains where he got the idea for the book, and how he did his research. He also includes a page about how regular and daylight fluorescence work. And if you want a quick, simple, explanation of fluorescence vs. day-glo fluorescence, check out this Charlesbridge site. As I said yesterday, I love books about brave, strong women. I love putting those books in front of kids, love saying look, this person made it and you will too. Well here's another book to add to the brave, strong women basket. 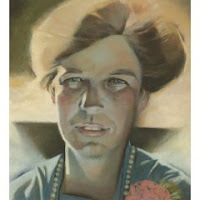 ELEANOR: QUIET NO MORE traces the life of Eleanor Roosevelt through a wealthy but very lonely childhood, overseas travels, meeting and marrying FDR, dealing with a domineering mother-in-law, managing a new kind of life after FDR was stricken with polio, advocating for the downtrodden, and finally living the life of First Lady. "We must be able to disagree and to consider new ideas and not be afraid." "Do what you feel in your heart to be right-- for you'll be criticized anyway." "I have never felt that anything really mattered but knowing that you stood for the things in which you believed and had done the very best you could." A brave strong woman I want all my students to know! As someone who has been known to "make a wave or two," I knew, the minute I read the first line, that I was absolutely going to love this book. And I did. MERMAID QUEEN: THE SPECTACULAR TRUE STORY OF ANNETTE KELLERMAN, WHO SWAM HER WAY TO FAME, FORTUNE, AND SWIMSUIT HISTORY tells the story of Annette Kellerman, the Australian woman who invented water ballet and maybe more importantly to many of us, the modern woman's swimsuit. Annette Kellerman was a sickly child whose father taught her to swim to strengthen her legs. Soon Annette was winning races and setting records. In 1903, however, not many women were athletes, and Annette's mother wished she would choose something a little more artistic. Ignoring all criticism, Annette and her father left Australia and traveled to England, where Annette was the first woman to attempt to swim the English Channel, then to Paris, and finally to Boston's Revere Beach. There, Annette was arrested and had to appear in court to defend her racy bathing suit! The tone of this book is bold and joyful and dashy and fun. And I don't know whether it was the author or illustrator or picture book designer, but they made some choices about font that I think kids (and their adults!) will find really interesting. The illustrations, by Edwin Fotheringham, are exuberant and splashy and fun. Each page has kind of a "wavish" background done in blues, or greens, or oranges, with cartoonish-characters kind of super-imposed over the waves. Sometimes there are "mini-illustrations," done in water droplets, super-imposed on top of all that. And then there are a few random comments, e.g. "How sweaty! How rugged!" worked into the illustrations. It's kind of hard to explain, but the illustrations really add to joy and exuberance of this book. Kit lit blog extraordinaire, "Seven Impossible Things Before Breakfast" did an interview of Shana Corey, and included several of the illustrations. Check them out here. A splashy, joyful, strong, fun picture book that I can't wait to share with the strong girls and women in my life! I spend fifty percent of my time working with intermediate grade kids who are still trying to get the hang of reading. The state of Colorado calls them UNSATISFACTORY (a term that NEVER, in my mind, should be applied to a child) or PARTIALLY PROFICIENT, and much of the professional literature calls them struggling readers. A couple of months ago, I read something (and I wish I could remember what) about "developing" readers. That terms seems a lot more positive, a lot more hopeful, and a lot more appropriate, to describe kids who are still working out the reading puzzle. When I work with developing readers, I have three goals. First, I want to help them develop the heart of a reader- the attitudes and beliefs, that readers carry in their heads, e.g. reading is valuable to me, I am able to read, there are reasons to want to read, reading has value to me. Next, I want to help kids develop the skills and strategies readers need, the phonics and comprehension strategies that will help them make meaning from those funny little black squiggles on the page. Finally, I want kids to develop the voices of readers, to become fluent, to read like people talk. The remainder of the book is organized into two-page spreads, with each spread focusing on a different way that each of the sixteen featured animals uses bubbles. 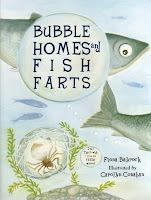 The section begins with a statement about how the animal uses bubbles, e.g. Bubbles are for fishing (humpback whales), bubbles are for talking (herring), bubbles are for nesting (African gray treefrog), followed by a paragraph of more detailed information. The illustrations are mostly pastel colors, watercolor I think. Each illustration contains a few cartoon bubbles that capture the essence of the text in a fun and different way. An appendix in the back contains more information about each animal, including scientific name, size, habitat, and a few fun facts, as well as a glossary. And don't miss the acknowledgments, with its extensive list of scientists who were consulted for this project! I can't wait to share this one with my developing readers! Nic Bishop is known for his jaw-dropping nature photography. Open a book cover with his name on it and you'll be greeted with stunning action shots, exquisite attention to detail, and sharp, sharp close-ups that inspire awe. Couple that with Bishop's equally crisp, up-close and personal writing in Nic Bishop Frogs, and you've got an award-winning combination of text and illustration that captures a child-like wonder about a topic that is anything but new. That's quite a feat. Bishop's language is interesting and playful, and his analogies and references are right on, squarely aimed at where kids' heads are at. Simple word choices never talk down, but will allow newish readers to find success easily. The book flows logically, covering life cycle, defense, diet, habitat, and other essentials you'd expect to find in an animal book, but the organization is refreshingly kid-friendly, meandering through the topics as though Bishop and the reader were having a conversation while sitting in a marsh waiting for a frog. It's intimate and personal and accessible---frogs as you've never seen them before. Fascinating process notes are sure to inspire young photographers. Substitute moths and butterflies for frogs, and you would have a pretty good review of NIC BISHOP MOTHS AND BUTTERFLIES. MOTHS AND BUTTERFLIES is an absolutely gorgeous book of nature photography, written by a biologist who clearly knows tons and tons and tons about his subject. He shares his knowledge in a way that is kid-friendly and accessible, yet not at all condescending or watered down. At the end of the book, Bishop shares a little about his process, including a story of an overnight trip to Costa Rica to photograph a rarely seen rainforest caterpillar that is able to puff up its body and look like a snake. I was fascinated by this story and dropped in at his website to look for similar stories about his process. One whole section of his site is devoted to an explanation of how he takes his photographs. Fascinating stuff! Ted and Betsy Lewin have spent their lives travelling the world, collecting stories and creating beautiful picture books. Their latest book, BALARAMA: A ROYAL ELEPHANT. For this book, the Lewins travel to southern India, to meet Drona, the lead royal elephant in an annual parade held in celebration of Dasara, a centuries-old royal and religious festival. The Lewins are so taken with Drona, that they decide they must return the next year for the parade. Unfortunately, sometime that year, Drona is electrocuted when a branch he is eating touches an electrical wire. When the Lewins return to India, they meet Balarama, the newest lead elephant. This book chronicles the Balarama's role in parade in words, but maybe more importantly, in Ted Lewin's glorious, glorious, glorious watercolor illustrations. The pictures are so real that I feel like I'm right there watching the parade. Wow, wow, wow! An appendix contains lots of helpful nonfiction text tools to share with kids. There's a list of interesting facts (did you know, for instance, that elephants' trunks contain tens of thousands of individual muscles, or that elephants are left or right-tusked, just like humans are left or right-handed?). There's also a pictorial comparison of Asian and African elephants, and a short bio of the five most recent lead elephants in the Mysore Dasara celebration. 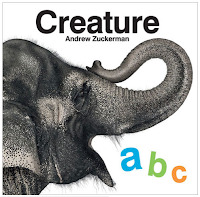 This new animal alphabet book is about as perfect as perfect can be. Each four-page spread begins with a photograph of an animal and a large upper and lowercase letter. The next two-page spread has a different photo of the animal, as well as its name. Readers have the opportunity to peruse an alligators' toes, get close enough to tickle the hair under an elephant's chin, flinch at kangaroos kicking, feel the prick of a porcupine's quills, and caress a vulture's wing feathers. The animals' photos, placed against a plain white background (with the exception of N for nocturnal, which is black) are absolutely stunning. Emergent readers can practice strategies like predicting and cross checking picture against word. This book is a treat for the reader's eyes! I am a charter member of the the Steve Jenkins Fan Club. I love the way Jenkins draws on children's natural curiosity to teach them about our world. I love how he makes complex information accessible to kids. And of course I love Jenkins' beautiful collage illustrations. SISTERS AND BROTHERS, and ACTUAL SIZE have long been two of my favorite nonfiction mentor texts. 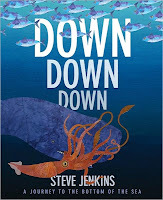 This weekend, Jenkins' newest book, DOWN, DOWN, DOWN: A JOURNEY TO THE BOTTOM OF THE SEA, leaped to the top of my list of all time favorite nonfiction/information picture books. "Viewed from space, the earth looks like a watery blue ball. Oceans cover more than two-thirds of the globe's surface, and well over half the planet lies beneath water more than a mile (1 1/2 kilometers deep). We have explored only a small fraction of the oceans. In fact, more humans have walked on the moon than have visited the deepest spot in the ocean. In this book, we'll descend from the ocean's surface to the sea floor and travel through one of the most extreme environments on earth. Along the way we'll encounter some unusual creatures…"
The bodies of most ocean animals are filled with fluids, so they don't have a problem with the pressure found under the ocean. Nine out of every ten animals that live below the sunlit layers of the ocean are bioluminescent- they can produce their own light. Anything containing a hollow, air-filled space, such as a human body or a submarine, risks being crushed as it descends. At 3,300 feet, marine snow, composed of dead plankton, fish scales, animal waste, and bits of larger creatures that have died in the waters above, is the primary food source for small animals, who then become prey for larger hunters. And of course, each two-page spread is illustrated by three or more of Jenkins' amazingly accurate and breathtakingly beautiful collage sea plants and animals. An appendix at the back of the book contains a paragraph about each animal, as well as a visual comparing the animal's size to that of the human hand. There is also a diagram showing what humans or vehicles have descended to particular depths. DOWN, DOWN, DOWN is a book that will fascinate kids (not to mention parents and teachers!) I could use the book to teach kids about tools such as headings and diagrams and appendixes. I could use it as a mentor for interesting nonfiction writing. I love having kids draw on Jenkins' work to create illustrations for their own research reports. A must-own for any library, classroom, or family! Today is a very special day at Carol W's corner. I am honored to host Georgia Heard and Jennifer McDonough, the authors of a wonderful new professional book, A PLACE FOR WONDER. The book begins with "Straight Line," a poem that perfectly captures how I sometimes feel in schools. Kids are so wonderful, and curious, and thoughtful, and then they come to school. Read the poem, but don't stop there! There is more below! like the brick wall behind them. they will lose their stars. at the top of their lungs. a star is taken away. I've followed your work for many, many years, and have been really convicted by the notion that teachers need to first be writers and poets themselves, if they are going to teach others to be writers and poets. As I read TIME FOR WONDER, I kept thinking about that, and wondering if teachers didn't also need to see the world through wondering eyes, if they were going to evoke that same sense in children. Do you think that is true? If so, what are some of the ways you evoke and cultivate wonder in your own lives? I do believe that teachers need to be writers and poets themselves if they are going to teach others to be writers and poets. I’ve always loved what Cynthia Rylant wrote: I once met a boy who was a poet. I believe he was born with a way of looking at things…and even if he never writes one single line of poetry, he’ll always be a poet. I believe that we’re all born with a poetic way of looking at things, and that young children are natural poets, but as we get older life sometimes squeezes the poetry out of us. Our job is to try and find that poetry inside us again; to try to find our voices. Writing alongside our students, at home, or briefly in the classroom, can help spark this. I try to find beauty everywhere I go. You don’t have to live in a rural or suburban setting -- I lived in NYC for over twenty years – and there was so much beauty there: flowers sticking out of the water buckets at the corner deli: the way the sparrows flitter and squawk over a bagel scrap in the street; morning light blazing down side streets; and so many other moments. It might take more effort in an urban setting, but if we just open our eyes we can find it. Having a young child in my house is an everyday reminder to see the world through different eyes. He is full of "whys" and "how comes," and teaches me to slow down and think about how kids see the world around them. I'm a teacher in an urban school. Ninety percent of my students are on free lunch. They are crammed into tenement apartments surrounded by little, if anything beautiful or wonderful. There is also not a lot of intellectual stimulation. The teachers at our school do everything they can to create warm and nurturing environment at school, but what kinds of tools can they give kids to help them carry a sense of wonder into their world, when lots of times it just simply is not very beautiful. I taught in schools in NYC that were like the one you describe above, and I really know how difficult it can be. The kids in your school need that sense of wonder nurtured. Bring the beauty of the world inside the classroom. Here is a gathering of a few ideas (all from NYC classrooms) to bring wonder and beauty inside. Bring in a small cherry tree branch (found at a corner deli in spring), and place it in a water bucket in the corner, and wait for it to bloom. If allowed, bring in hermit crabs, and other living creatures. Bring in blooming plants. A terrarium. A discovery table with shells and nests displayed next to a magnifying glass. A single flower in a vase. Hang a cloth or a quilt on the wall -- especially if there is a story behind it. Ask kids to plant seeds or bulbs, and watch them bloom. One small square would be a great idea for kids to really look deeply and see their world with new eyes. Even putting the square on concrete and looking at it through a microscope can evoke a sense of wonder at what unexpected things they might find. And so many more ideas… Make your classroom the beauty that the kids might not be able to see outside. Read The Old Woman and Her Secret by Eve Merriam, and tell them that their job this year is to ask questions, and be filled with wonder; and then set up wondering centers so the kids can begin to express that wonder. We do lots with nonfiction and research with our students. I don't think, howeer, that we are as good at researching their "heart wonders." I'm wondering if you could talk a little more about the kinds of things that you do to help kids address their "heart wonder" questions. “Heart Wonders” are the big, pondering, and sometimes personal questions that we ask ourselves such as: What will my future be? ; What makes a friend? ; Why do bad things sometimes happen to people? These questions are meant to be pondered, savored, and explored by reflecting on them but also by having a conversation with another person; they are not necessarily researched in the same way as more informational questions. We tell younger kids that “research wonders” are questions about things that you can hold in your hand (although this isn’t always true), and “heart wonders” are those questions that are about what’s in your heart and mind. As we describe in our book, the two types of questions often blend. Many personal essays come from “heart wonders” – explored through personal writing. So, so, so many ideas in the book could be used in intermediate grades. I'm wondering, though whether, you would whether the two of you might ever consider doing a sequel, with Jen teaching and Georgia conducting research in an intermediate grade classroom? That would be a fun book to read? Thanks for the suggestion! We’ll definitely think about it. I'm also the mom of two high school kids. My guys go to a high school that is considered to be the best in the district, yet there is very little, if any, space for kids' passion or interest, or engagement or wondering within the walls of the classroom. I wonder, then, how can middle and high school teachers embrace your ideas? What can parents of high school kids do to restore joy, and passion, and wonder to their kids' learning lives? You’re so right – when kids get into high school their passion, interest and sense of wonder diminishes. This should be the subject of another book but, briefly, teachers could make room for students’ questions in each subject – and devote part of the class to exploring these questions. Can you imagine if there was a class called Pondering Time where students ask “heart wonder” questions and, then write to explore the answers? I so, so, so loved this book. I so, so, so needed this book. I want you to read it too. You can read the book or order it at Stenhouse. Also, Georgia and Jen will be hosting a web conference on Monday night. If you would like to be part of that, please leave a comment below. Davies then explains, in 1-2 page spreads, how this rule impacts any number of aspects of human and animal physiology, e.g. why people can't fly, why animals can only be "so big," how the surface area of the gills and the intestines are increase the efficiency of the respiratory and digestive systems, how size impacts travel, etc. Each of these topics, and lots of others, are complicated, but Davies explains them in a way that is friendly, and understandable, and humorous. And there are tons of fun-to-know facts embedded throughout, e.g. "If you spread out the skin that makes up the air sacs in your lungs, it would cover most of a tennis court" OR "Gibbons used to be large, tree-climbing apes, more like chimps, but when they started to get around in the forest by swinging from tree to tree, having a nice, light body was convenient…now they are the lightest ape, the size of a fat domestic cat." Kids (and adults) will also love Neal Layton's humorous, cartoon- style illustrations. They're funny, but also packed with tons of information that complement the text. The illustrations will be great "mentor texts" for my fourth and fifth graders, who already know quite a bit about diagrams, and need to stretch themselves a little. I think it would be fun for them to choose three or four significant facts, then try to embed those some how in their illustrations. act on a noble impulse. -- POETRY FRIDAY is at the home of poet extraordinaire, Laura Salas. In late September, I blogged about A PLACE FOR WONDER, a fabulous new professional book by Georgia Heard and Jennifer McDonough. 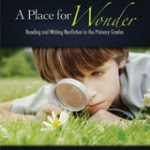 In A PLACE FOR WONDER, Heard and McDonough examine how teachers can create “landscapes of wonder,” classrooms where curiosity, creativity, and observation are encouraged, and where intelligent, inquiring, lifelong learners are developed. Heard and McDonough created "wonder classrooms" in McDonough's kindergarten and first grade classrooms, and in the book, they share some really practical and concrete ideas for teachers to help children not only see their world, but also write about it. "Our goal was to create a landscape of wonder in primary classrooms—a landscape in children’s minds and hearts ﬁlled with wonder and awe about this amazing world we live in." "We knew that it’s important to not just ask the questions but to learn to explore questions. We wanted to set up time for the children to ponder their questions and teach them how to go about exploring those questions." I loved this book and have been trying to implement many of Heard and McDonough's ideas into my teaching, and also into my parenting. I was thrilled to be included on Heard and McDonough's blog tour, which starts later this week. 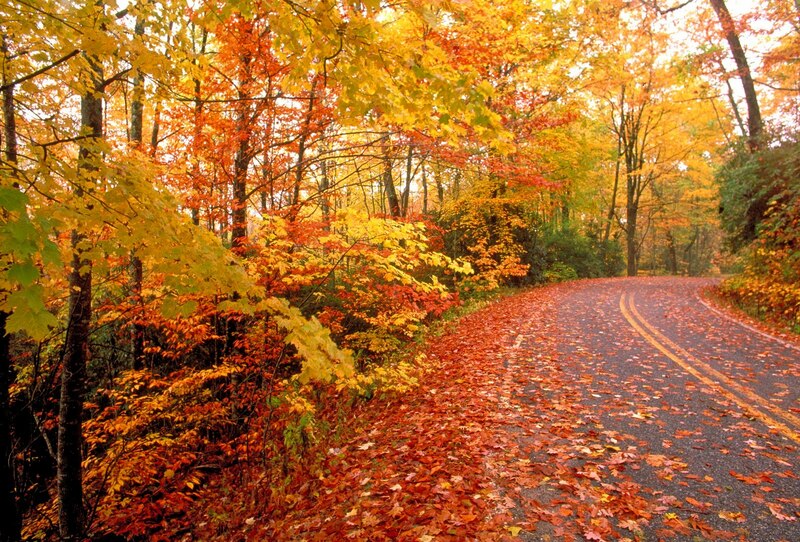 October 23: Carol’s Corner (can you believe it, right here!). As part of that tour, I get to send some questions to Georgia and Jennifer, so I'm opening this up to my readers. Take a look at the book (you can preview the entire book online here), then email me with your questions. I'll pass them onto Georgia and Jennifer, and maybe they will answer them! Also, as an EXTRA SPECIAL SUPER DUPER AUTUMN TREAT, Stenhouse will wrap up the blog tour with a LIVE WEBCAST with Georgia and Jennifer on Oct. 26th at 8 p.m. EST. This will be a great opportunity to join a small group discussion with the two authors. Five participants for this live webcast will be chosen from the comments in this post and the blog tour post on October 23 If you would like to have your name thrown in the bowl, post a comment or question about the book here. Include your email address so I can contact you if you win! No special software or equipment are needed to participate in the webcast – just a phone and your computer. From now until the beginning of the tour you can also receive free shipping when you order A Place for Wonder. Just use code “blog” at the checkout when you order from www.stenhouse.com or by phone at 800-988-9812. Have you nominated your favorite new books for the CYBILS? Anything published between October 16, 2008 and October 15, 2009 is eligible, but TODAY is the last day you can nominate a book for this honor! Hurry on over to the CYBILS site and get busy nominating! Watched by well over ninety thousand people who cheer him on with a loud hip hooray. Last summer, I tutored a little guy who was going into third grade, but reading at a beginning first grade level. Three or four times a week, I picked G. up and we went to the neighborhood library and read. Originally, I tried to steer him toward the easy reader section- Dr. Seuss, the Elephant and Piggy books, and the Rookie Reader science series. G would have none of it. He wanted books about cars, and more specifically, books about low riders. We exhausted all of the books in that library, then moved to the larger world of interlibrary loan. By the end of the summer, I knew quite a bit about low riders, and G had started to read and had written a twenty-page book about low riders. G reminded me (AGAIN!) about the importantce of motivation and engagement in reading. The EASY READERS were painful, but put G in a book about low riders and he could read words like Chevrolet Impala, hydraulics, chrome, velvet and horsepower with absolutely no problem. He could read those words because he cared about them. This year I'm spending my mornings teaching intervention groups to second and third graders. The groups are about 75% boys. We are reading a lot of nonfiction and I've just found a new book I think they will love. TRUCKS is a Level 1 (first grade, not DRA Level 1) National Geographic Reader in a series that also includes topics like storms and frogs. 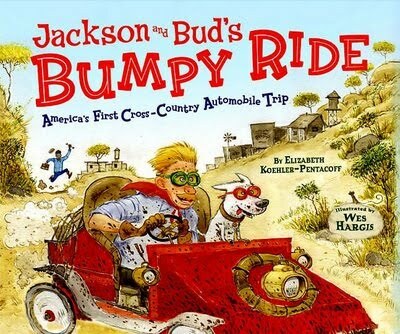 The book is narrated by Slick, a truck driver who appears on every page. Each two-page spread is about a different kind of truck-typical ones like dump trucks, tow trucks, and cement mixers, but also some that are more unusual, e.g. the world's largest truck, the Liebherr 282. The last three pages show Slick's rig, including the cab and dashboard, and his office/sleeping quarters. Each two-page spread contains a great picture, and 2-4 sentences of juicy information. I know G and has buddies are going to love this book. After they are done examining all of the different kinds of trucks, I can use the book to teach them about nonfiction tools, because TRUCKS has all of them- a table of contents, headings on each page, labeled diagrams, "truck talk" vocabulary that is pulled out in a little text box on many of the pages, and a glossary in the back. Many of the pages have truck-related riddles, e.g. "Q: What is the laziest part of a truck? A: The wheels, they're always TIRED." I'm putting this book in my school bag right now. I can't wait to share it with my reading buddies. I know they are going to love it.